A.P.C. silver-tone necklace with medallion pendant. 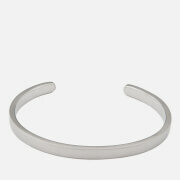 Designed with delicate vertical ridges on the front and engraved A.P.C. branding on the reverse. The brass necklace is treated with an anti-oxidation varnish and comprises a fine curb chain with a snap hook clasp for an adjustable length. Supplied in a branded drawstring pouch. Chain Length: 27cm. Pendant ⌀: 2cm.